H. 14168 - luxury unfolds in its most functional form in this jeff harrell designed caribbean-plantation-style and gated gordon drive compound. Formal living is presented through inviting resort-style spaces that offer unobstructed champney bay views of the estuary and beyond. Soaring coffered ceilings and intricate wall paneling frame the most exquisite details throughout this enviable home. A gourmet kitchen with 6-burner gas stove and extended island generously gives way to an expansive morning room with picture windows overlooking lush tropical landscaping and long bay vistas. The outdoor space provides the perfect setting for entertaining across several covered seating areas that include a fireplace and scenic koi ponds. Enjoy your private boat dock and secluded beach cove just steps from your back door. An ideal family retreat with separate 3-bedroom guest house and theater room. Perfect for the avid collector with air-conditioned garage for 8+ automobiles and a wine cellar for 1000+ bottles of your favorite varietals. This property also qualifies for a full port royal club membership. 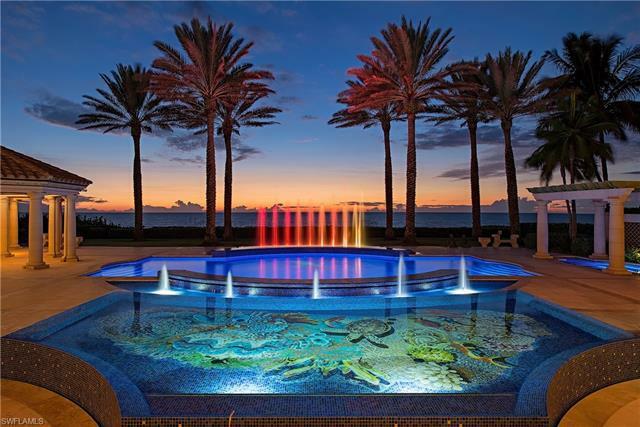 Stunning gated waterfront estate home plus its own field of dreams. These two properties are visually combined though separately deeded creating one particularly spectacular and incredibly rare waterfront offering in the moorings. Over 225' of linear water frontage, over 200' of depth, approximately 1 acre of park-like waterfront perfection. Two properties, one price. Multiple docks for multiple boats, personal watercraft, paddleboards & kayaks including 13,000 lb. Platform boat lift area that is also perfect for fishing which is also true for 30' floating concrete boat dock / pier. Authentically special, no mandatory hoa's or monthly / quarterly hoa fees, no architectural review boards etc. Moorings resident's beach access considered by many to be one of the prettiest sections of beach in naples nearby. Residence designed / built to last. This truly celebrates waterfront living in naples - gentle winds blow as you sit in one of the swings hanging from the massive cascading cuban laurel tree along the waterfront - relax in your 50'+ pool as the sun is setting while the inland waterway and lights begin to twinkle. Unsurpassed waterfront value from park shore to port royal. C. 15416 - beautiful glass openings to unobstructed gulf views and sugar sand beaches from the 14th floor with west and south facing views. 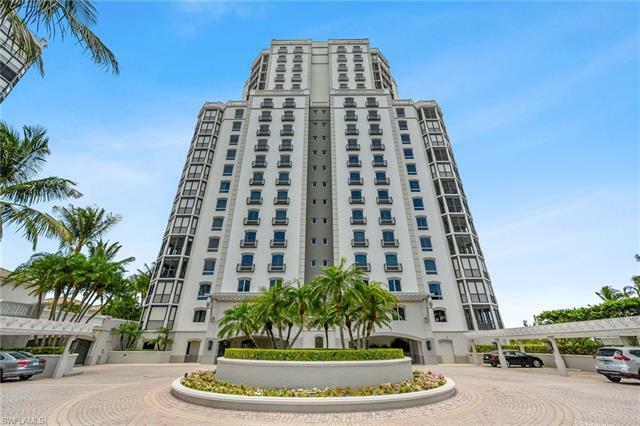 The world class windsor sits directly on the beach in the private gated community of bay colony. The 6,155 sq feet of living space offers four bedrooms, four and a half baths, a large office, built-in high speed internet, and 3 screened balconies. A large kitchen with a gas stove, two dishwashers and 3 sinks with disposals and dual ovens. A wet bar for entertaining and 2 bedroom suites with a wet bar and one en suite with kitchenette. The master bath has two closets and a cedar closet, jetted tub and separate sinks and dressing area. Windsor offers a 24 hour staffed front desk, three guest suites, secured parking which will accommodate 3 cars, social, fitness, and a conference rooms. A beautiful resort pool and spa with gulf views. Membership in the bay colony beach club and tennis club is included. Equity golf club available separately. A great opportunity to be in this exclusive building.